Over the past year OCASI and some of its members have been intimately engaged with the debate on the Canada Jobs Grant program and the implications for Ontario's newly arrived immigrant populations and other groups with little or no labour market attachment (which makes them EI ineligible); supported the campaign to increase the minimum wage to $14/hour; took every opportunity to speak about the need to increase social assistance rates including ODSP (Disability support program) and the need for a boost to the Ontario Child Benefits program. Needless to say there was great anticipation about the 2014 provincial budget. Imagine then the response to the not unexpected decision of the opposition parties to withhold support for the budget, setting the stage for a provincial campaign and an election in mid-June. Read more of Debbie's observations on change happening in the sector. Family Service Toronto is proud to showcase its new Centennial video that celebrates its past and recognizes the great work it does every day. The video launch marks the official start of year-long celebrations extending across all FST divisions and departments as they recognize the most important milestone in their history. It is a time to pay tribute to the past, celebrate the present and embrace an exciting future. Throughout 2014, FST will host signature events and organize other activities to highlight its work in the community and its leadership in the social services sector. Follow the Centennial blog for event details and stay tuned as FST prepares to showcase its remarkable century of helping move Toronto to a better quality of life for all. OCASI is pleased to announce the launch of the online Accessibility training. This is the first version, and there may be changes going forward. This self-directed training will focus on barriers to wholistic settlement services for newcomers with disabilities experience. It is specifically targeted to train frontline settlement workers and management. This online course was designed to bring greater attention to this marginalized group so we can continue to work together support them their integration. Click here for more information and to join the course. Ontario's Minister of Citizenship and Immigration tabled the province's first-ever immigration legislation on February 19, 2014, Bill 161, An Act with respect to immigration to Ontario and a related amendment to the Regulated Health Professions Act, 1991. On April 15, OCASI and CERIS held a very successful joint panel event to discuss the implications of the Bill. Read here for more information and access to video recordings of the event. OCASI is now accepting application for the Professional Education and Training (PET) for the fiscal year, April 1, 2014 to March 31, 2015. PET can be accessed by all immigrant services organizations funded by Citizenship and Immigration Canada (CIC) and the Ontario Ministry of Citizenship and Immigration (MCI) to pursue individual training for employees at the institution of their choice or to deliver group training within the organization. Training and developing employees is crucial to the overall success and innovativeness of any organization. PET is an important resource for immigrant service workers and organizations. OrgWise Organizational Standards Assessment tool uses a set of standards and indicators to measures and gauge the health of organizations in the following four areas of organizational development: Community Based Approach, Governance and Strategic Leadership, Operations, and Human Resources. Through OrgWise assessment agencies are able to see a clearer picture of their strengths, challenges and areas for growth. OrgWise self-assessment tool is unique in that it provides organizations with a comprehensive report of the overall health of their systems and infrastructure; helps to manage risks; communicate strengths and achievements with communities and stakeholders; and ensure sustainability so that the agency can fulfill its mission and achieve its vision. OCASI is piloting the Positive Space Assessment Tool! The Positive Space Assessment Tool was designed by OCASI in 2013-2014 to benchmark organizational standards for serving LGBTQ+ newcomers. It can be used by organizations to: Understand clearly what a Positive Space is, involves, and looks like in both theory and practice; Assess how positive their space really is for LGBTQ+ newcomers and staff, including compliance with Ontario Human Rights Code laws and best practices in settlement services; Identify key strengths and target areas for improvement and much more. The assessment is carried out through an anonymous online questionnaire covering the six key areas of: Policy & Implementation; Staff Knowledge; Accessibility & Inclusion; Organizational Culture; Resources & Programming; and Ongoing Evaluation & Improvement. For more information please contact Erin Ewing, Project Coordinator - Positive Spaces Initiative at [email protected] or 416-322-4950 Ext 265. On Thursday, May 22nd, 2014 the Community Worker Program presents The Tommy Douglas Institute's Critical Pedagogy and the Citizen Student: A Just Society is Possible at George Brown College (St. James Campus). The all-day event of breakout sessions, interactive exhibits, and a closing community forum will open with a keynote address delivered by journalist and social activist, Judy Rebick. LAO has released a new report, Updating the quality standards for LAO-funded refugee and immigration service providers to share feedback received during its recent public consultations and to outline next steps. The report commits LAO to collaborating with the Refugee Lawyers Association and, taking into consideration the concerns and feedback received so far, and to developing a second draft of the standards. LAO will use this second draft as the basis for further consultation and development with stakeholders. Its goal is to finalize and implement new quality standards for LAO-funded refugee and immigration service providers later in 2014. As part of its membership program, Ontario Nonprofit Network (ONN) is offering comprehensive insurance program designed specifically for registered not-for-profit corporations operating in Ontario. Nonprofits have different insurance needs than for-profit businesses. ONN has done all the homework for you and has found plans that will strengthen your organization's governance, reduce costs and protect your organization and staff. ONN has partnered with HUB International, a organization started in Leamington, Ontario in 1988. HUB works with multiple insurance companies for ONN's program to ensure the best competitive rates. 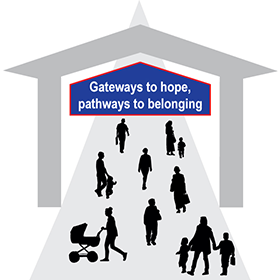 Gateways to hope, pathways to belonging - Saint Mary's University, 923 Robie Street. For newcomers, arriving in Canada at a place like Halifax's Pier 21 is not an end but the beginning of a journey. Many people seeking protection in Canada arrive with little more than hope and become well-established and valuable contributors to our communities along the way. Join us at the CCR Spring Consultation to explore questions affecting refugee protection and newcomer settlement, so that we can build stronger and more welcoming communities together. Register before 9 May to take advantage of reduced fees! Click here for the provisional Consultation program and for workshop descriptions.